Know how to relax by practicing breathing exercises. Consider the possibility of an actual harm from situations you fear. Reduce your intake of caffeine to be less anxious. Getting on the plane or locking up on a Ferris wheel is, for 5 percent of us, a spiteful plight. Sitting on the cliff overlooking the grandeur of hilly ranges is no soulful adventure for such people. 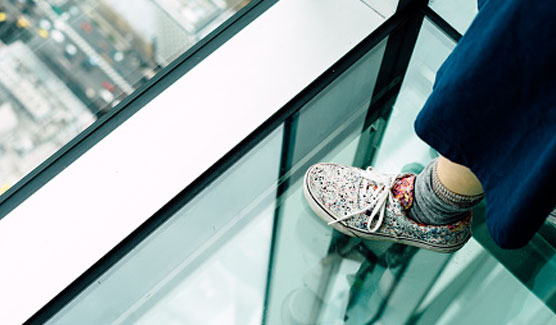 Let’s just say, fear of heights or acrophobia is one of the most common phobias in the world’s demography. The fear can be so debilitating for some that it causes their performance to drop at school or work and hamper their everyday activities. If you fall into the category of such people, here are tricks to overcome the fear. The more you understand your fear, the better chance you will have to feel less anxious about it. Learning about the fear will help you to challenge unrealistic or negative thoughts about things that you fear. Gradually exposing yourself to your fear will help you to tackle it. Imagine yourself doing what you fear. For instance, if it is going to the rooftop and looking down, conjure up every moment in your mind as it happens. Control your breathing while you imagine the situation. If the fear is deep- seated, you may take the help of a therapist. Phobia is if you know its definition, an irrational fear that a lot of people do not find threatening. Most things that make you fear height such as skyscrapers, roller coasters, airplanes, etc are quite safe. These things are made in such fashion that they remain sturdy and will be secure as much as possible. Thinking about the odds of being struck by lightning, which is calculated to be far more than the odds of someone dying because of a building falling down or an aircraft crashing, you will be able to fight your fears. Engaging in relaxation activities can prepare you before you have an anxiety attack as a result of your phobia. A relaxation technique that you may use could be breathing exercises. Do them while you imagine the situations that you fear. Doing these practices can help you to become sensitive to your emotions and be connected with the physiological processes such as heart rate, breathing, and sweating. Scientific studies have shown a relationship between consumption of caffeine and triggering of anxiety-related acrophobia. Therefore, limiting or abstaining from your caffeine intake can alleviate symptoms. Additionally, cutting down caffeine will help you to be more relaxed. Do not push yourself to face a particular situation if you just cannot handle its thoughts. Also, do not miss out on opportunities to enjoy and try to explore all the options in depth. If you just cannot get over your phobia, seek cognitive behavioural therapy or other such treatments.